Have you ever had a really important event that you wanted to look the best for? Have you ever wondered how your smile might influence a job interview or date? If you answered yes to either of those questions, or if you just would like to have whiter teeth, Luster Premium White Oral Care has a product you! I had the chance to review Luster's Weekend White teeth whitening system. The Weekend White system claims to whiten your teeth 6 shades in just 3 days! I was so excited to try this product out....but, when I had my husband look at the shade guide he told me my teeth were already a 1...two at the worst. I didn't feel it would be fair for me to use the product when my teeth were already white. So.. I asked my husband to try it out. My husband only drinks Pepsi and Coffee, so naturally his teeth are fairly stained. Here are the photos from before, and after 3 days of the Weekend White system. 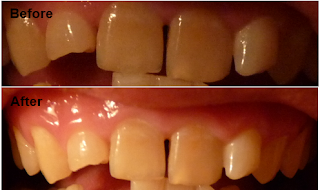 I really don't think the pictures show the change very accurately, his teeth really did get whiter. My husband's teeth started off at a 13 on the shade chart, and at the end of the 3 days, I would say his teeth are between a 8 and a 9. So, that is 4 or 5 shades whiter in just 3 days! I think the Luster Weekend White system is a great value for the results, and much cheaper (and more convenient) than professional whitening. The product is definitely worth trying! Luster Weekend White can be purchased for $19.99 in Luster's store. white teeth for new years!! I'm a follower! I follow luster on twitter! We were wondering if you would be kind enough to write a review on Luster teeth whitening product on our teeth whitening website called Teeth Whitening Product Reviews. We are trying to find real reviews from people who actually tried this product.